With a range of industrial engines from 66 u pto 550 kW the Swedish company VOLVO PENTA offers driving engines for different purposes, also for power generators. This company is one of the most well known manufacutrer of this branch of business. MITTRONIK offers power generators with slow turning VOLVO PENTA diesel engines in a range from 80 up to 620 kVA rated power. 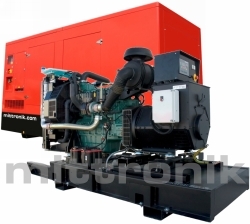 The gensets are available in open frame version, in weather and soundproof canopy or in container version. Manually (digital) control panels, type MCP, or digital switchboards with automatic start/stop at mains failure, type ACP, are available, depending on the generator set application. A large range of options enable the customization to the requirements. This is valid for emergency distribution or for mobile use on a trailer to deliver electricity for construction sites. The soundproof generators of VOLVO powered MVW series are optional available with an extended base frame tank with 225 to 2.100 liters volume. Rated power at 400/230V, 50 Hz. Fuel consumption at 75% (3/4) PRP load. Speed at 60 Hz: 1,800 rpm. Available voltage at 50 Hz: 415/240V, 400/230V, 380/220V, 240/120V, 230/115V, 220/110V. Available voltage at 60 Hz: 480/277V, 460/265V, 440/254V, 240/120V, 230/115V, 220/110V, 208/120V. Rated Power kVA/kW - PRP Prime Power according to ISO 8528 - maximum available electrical power (at variable load) within the specified maintenance intervals for an unlimited number of hours per year. The average power output may not exceed 80% of PRP power within a period of 24 hours. 10% overload is permitted only temporarily. Technical data relate to standard reference conditions according to ISO 8528: +25°C, 100 m ALT (1000 mbar), 30% relative humidity. During running-in period of the engine the output increases by approx. 5%. The performance values decrease at higher altitudes, with higher temperatures and higher humidity conformance with DIN ISO 3046. For further information and an offer about our power generators we are looking forward for your inquiry.